Hi friends! 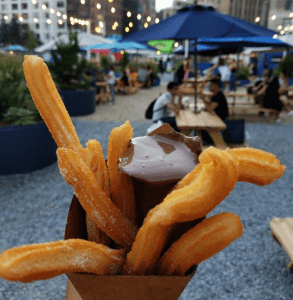 As many of you intrepid Smorg’ers know, our beloved NYC food festival now has a new location! 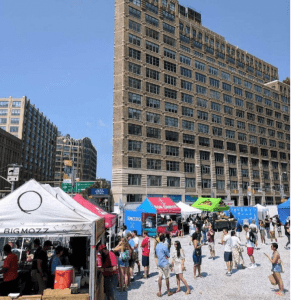 That’s right–all you have to do is make a quick stop at “Smorg Square” (76 Varick St. right by Canal) on Friday and Saturday between 11 a.m. and 10 p.m. or Sunday between 11 a.m. and 8 p.m. to partake. According to Eater, this location is set to run for about two years, which is great news for all the New Yorkers who will have a hard time reaching the Williamsburg location once the L shuts down. 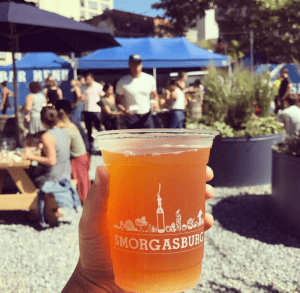 Smorg Square boasts a bar, an outdoor deck, plenty of seats, and 20 vendors including Big Mozz Sticks, Lumpia Shack, Ramen Burger, and Goa Taco. The options were fewer than other Smorgasburg locations but we still had a hard time choosing our meal. 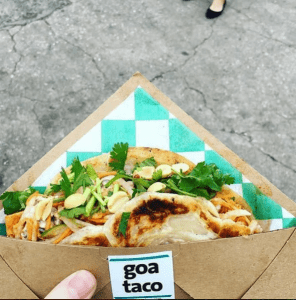 After doing two laps and pondering a bit, we finally settled on two tacos from Goa Taco. First up was the Slow Roasted Pork Belly Taco, topped with pickled red cabbage and chipotle mayo. We also loved their vegetarian option, the Tofu Bánh Mì, which was filled with shiitake mushroom pate, crunchy vegetables, and peanuts. 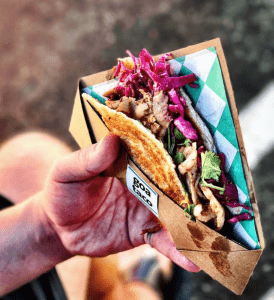 The shell of Goa Tacos are made from paratha, which their website describes as “the buttery, flakey lovechild of the tortilla and croissant filled with all delicious things from everywhere.” We’re happy to report back that both tacos were utterly delicious. After eating our food, the sun began to set and we decided to bid adieu to Smorgasburg. Until next time, Canal St.!